In the 32nd commemoration of its foundation, MOOYOUNG CM will fairly and squarely grow to a creative and innovative enterprise for the 21st century construction technology on the basis of its new resolution and with the support of its executives and employees who have global technology and knowledge. 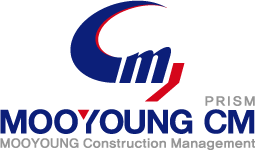 As an honest partner, MOOYOUNG CM puts customer impression in top priority to become a global Top-class engineering & construction management enterprise. The overall rhythm and wave-like curve symbolize the challenge and passion for the future and the power and leap of MOOYOUNG CM as the best enterprise. The crescent symbolizes the MOOYOUNG CM doing the best to fill it up. ‘‘My’ symbolizes the creative CM organization of communication between me (M) and you (Y). Exclusive colors are one of three factors to identify MOOYOUNG CM. Two other factors are corporate mark and logotype. The colors serve the critical function of delivering the image of MOOYOUNG construction when being applied to corporate mark, logo type, and various visual media. COPYRIGHT @ 2016 MOOYOUNGCM ALL RIGHTS RESERVED.